My entry for this week's theme are some of my collection of old coins which for me are rare these days as these coins were replaced by many generation of silver coins. These coins were made in early '70s and my collection dates from 1972 to 1974. These coins are very different with the latest coins as it has money value. I've learned from one of my former office mate that in their place these coins were bought at P600 and up. Actually they sell some of their collections. When I was still in primary and secondary schooling it's my hobby to collect stamps and old coins. 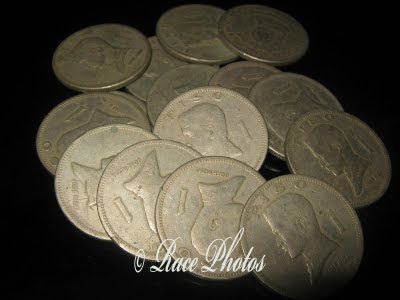 These One-Peso coins are my favorites as it has a deep engraved face of Jose Rizal's, Philippine National Hero. You can gauge from the picture that it's really rare, just see how old it is. See more Thursday Challenge 'Rare' entries here! My younger son is also a collector, the oldest currency he has right now is the Banana Money issued by the Japanese during the world war 2. Of course the money became worthless after the war but a treasure to collectors. What a good idea for 'rare.' Nice photo too with the dull silver color against black.